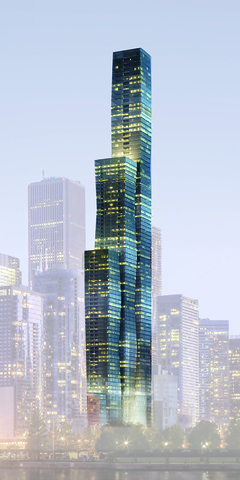 Introducing Vista Residences Chicago&apos;s New Luxury Tower an architectural masterpiece, designed by Jeanne Gang complimented by a Wanda Vista 5 Star Hotel located in Lakeshore East. World-renowned interior design specialists Hirsch Bedner Associates (HBA) created four distinct finish palettes with no detail overlooked. Gaggenau &amp; Thermador appliances, Snaidero cabinetry with cantilever countertops, wide plank hardwood flooring throughout, Kallista plumbing fixtures, full height stone walls with Robern medicine cabinets. Amenities include indoor &amp; outdoor pools, hot tub, fire pit, fitness &amp; training rooms, private dining room, demo kitchen, private wine storage &amp; wine tasting room, enclosed dog exercise area. Indoor Parking available for additional charge. Delivery between 2019 to 2020. 445 Arlington is an intimate eight-unit development that offers the rare opportunity to own an exceptionally spacious single level residence with 30+&apos; wide interiors in the heart of Chicago&apos;s coveted east Lincoln Park neighborhood. With only two units per floor, each residence offers private elevator access, expansive three+ bedroom floor plans, tremendous natural light, garage parking included and, of course, supreme finishes. Designed by Booth Hansen Architects to complement the historic row home architecture found throughout the neighborhood, the building&apos;s elegant limestone and aged brick facade is highlighted by oversized bay windows providing extraordinary light into each home. Nestled on the intimate block of Arlington Place and within steps from the lakefront, parks, zoo, schools and endless lifestyle destinations. 2W offers two outdoor spaces totaling over 500SF, walk-in pantry, oversized master closet and expansive bay windows. One garage parking space is included. Introducing 530 West Dickens by Ranquist Development Group. Incredibly unique opportunity to own a duplex-up penthouse. Over 3000 square feet of living space across 2 levels with an enormous private rooftop deck and private elevator entry access. Floor-to-ceiling windows and spacious extra-wide floorplan. Perfectly curated finishes include cabinets by Arclinea, Wolf and Subzero appliances, Grohe fixtures, Ann Sachs tile and custom master closets. Located just steps to Oz Park and situated on a premier East Lincoln Park block walking distance to Parker, Lincoln and Lincoln HS. This is an outstanding duplex for your most discerning buyer who wants a special unit in an unmatched location. The building is under construction with delivery October 2019.